Microsoft just unveiled a new beta service on Monday that's supposed to help ease that tension by allowing anyone to build an app -- no software development experience required. 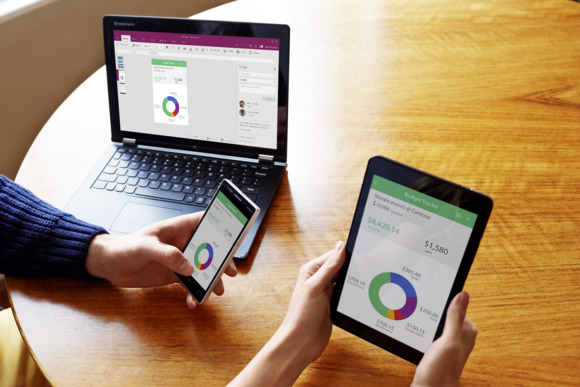 PowerApps combines a cloud application backend with easy-to-use tools that make creating a mobile app a drag-and-drop affair. Right now, PowerApps is available in a limited public beta: anyone can sign up for an invitation, but Microsoft has the final say over who gets to try PowerApps right now. Users will be able to get their feet wet with PowerApps for free, and can use the service to create unlimited apps that integrate with up to two cloud data providers. The paid Standard tier allows unlimited cloud data integrations and an Enterprise tier lets users build apps that take advantage of data stored on-premises. Microsoft hasn’t revealed an exact price for the two tiers, but Staples said that it will be sold on a per-seat basis, and Microsoft wouldn't require companies to pay for the cloud infrastructure running their applications. Another interesting thing about PowerApps is that it’s a direct competitor to one of the companies in Microsoft’s venture capital portfolio. SkyGiraffe is a Silicon Valley-based startup that offers very similar tools, and has been backed by Microsoft Ventures. While SkyGiraffe and Microsoft have been connected for several years, this new product doesn't have direct ties to the startup. This new service is another part of Microsoft’s push to let rank-and-file employees work together spontaneously without the help (or meddling, depending on your perspective) of IT and management. Earlier this year, the company released Office 2016, a major release of its productivity suite focused on helping employees work together.